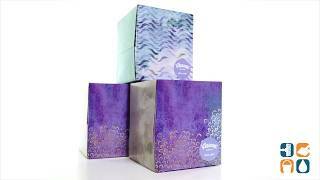 Ultra-soft absorbent facial tissue is kind to runny noses. Durable three-ply tissue provides softness and strength, preventing break-through. Added sneeze shield helps keeps hands clean. Attractive box complements any home or office decor. Tissue Type: Facial; Number of Plies: 3; Number of Sheets: 75 per box; Length: 4 1/2".